From simple choice-driven text-based tales to expansive choose-your-own-adventure gamebooks, interactive fiction is becoming increasingly popular. So much in fact, that entire competitions revolve around this particular video game genre. It’s also one that’s easy to get into for aspiring developers, since in theory, all you really need is the ability to write a coherent story with a bunch of twists and turns. Certainly easier than piecing together, say, a first person shooter. For those not familiar with The Spring Thing, it’s an annual interactive fiction competition that’s been around for more than ten years now, and unless I’m mistaken, this year has set a new record with a grand total of ten games. 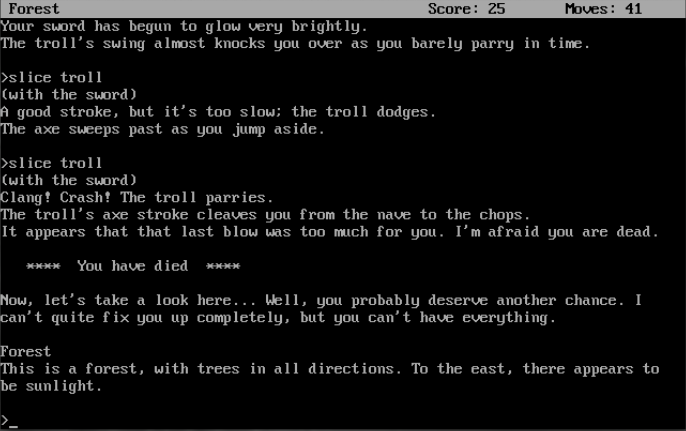 Ain’t just the ‘multiple choice’ sort either among this lot, as more than a few require the player to input commands… just like in Zork, and other such classics. Yay, nostalgia! All The Spring Thing 2014 entries can be found here. Most are playable online, with a few only available as downloads, and vice versa. Voting ends on May 11, so be sure to keep that in mind as you embark on a journey through these ten texty tales. Should you find yourself hungry for more afterwards, the Interactive Fiction Database is overflowing with content, and additions are quite frequent to say the least. And don’t forget about the XYZZY 2013 awards while you’re at it.